Temple of Ranma's Sailor Senshi Seifuku • View topic - Tendou house map - now with cardinal directions! Tendou house map - now with cardinal directions! I was Doing Research for the furo scene I'm writing aaaand... Granted, the kanji on the map from the wiki are barely legible. BUT! if you assume the arrows mark cardinal directions, you can easily match these kanji-shaped blobs to the four kanji. And voila! The entrance faces east, the living room's view towards the pond is south, Akane's windows face west and the dojo is to the north. Last edited by Cheb on Tue Feb 06, 2018 3:33 am, edited 1 time in total. Re: Tendou house map - now with cardinal directions! I had the same problem in the Negima Anime. Well the directions certainly make sense on an architechtural basis. Having the living room opening towards the pond to the south can be considered a very normal way to design a house. Kitchen to the north is also a standard thing(less direct sun means less heat where it shouldn't be, which means food spoils a bit slower, and in older houses it also means its easier to have a low temp pantry there). I'm talking the interior of the room does not allow for proper matching of the known exterior house structure. Sigh... There are continuity errors with that room depending on image looked at. Most are small, some are not. - The floor is carpeted, no tatami. Not an issue, just a note the girls rooms don't match the rest of the house design. - We know she has no ceiling light, unless Kodachi was covering it with her body. The style of lights shown elsewhere in the house would preclude that, as she was not in the right position for such. - The door swings to the right. However, *sometimes* it is hinged wrong to swing inward. And I found one image with the knob on the wrong side. It must swing inward to right, as Ranma slammed Kodachi that way. - On the wall with the door to the left, there is *sometimes* a 3 bulb light. However... it is not always there. For example, in two images on side by side pages, it appears and disappears. Also *sometimes*, her school uniform hangs from a hanger connected to the bottom middle under the middle bulb socket. Also *sometimes* present on the wall, is the light switch for the light. - On the left wall next to the closet lengthwise against the wall is her bed. The footboard is closest to the door, headboard closest to the window. Above that bed length is *sometimes* 2 pictures, *sometimes* 1, and the one always present has something hanging from it. - On the wall opposite the door, is the bed headboard, which *sometimes* contains her clock, a clock with no wire, and a picture frame above it is another large picture or cork board, with a Polaroid tacked to the corner (*sometimes* this is 3 smaller photos with no cork board). While the headboard is the type to have a shelf in it, and doors, no such items are indicated. - On the wall opposite the door, next to the headboard, and under the center window, is her student desk. Which has two drawers on the left (*sometimes* she has finger holds on the desk drawers and *sometimes* not, and *sometimes* it is 3 drawers instead of 2). 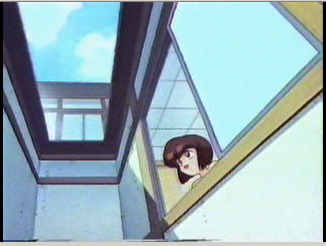 Note, she apparently never got back her desk lamp, as she threw it at Ranma in the Ryoga arc, but it was not visible in the Kodachi one. Unless she moved it to the far side of the desk, which is unlikely considering the size. Also, that window tends to change size based on scene. At one point there is a decent gap between it and the bed (with something on the wall that is *sometimes* there), at others the window is right to the bed, with nothing but the drapes on the wall. She also kept a square mirror, 5 books, some I believe cassettes, and a round pencil holder. - The chair is a swivel with wheels task chair. one piece for seat and back, covered in fabric. - To the right of that desk against that wall toward the left wall, is a trash can for paper, a small 1 shelf stand for books, and her weights (when the weights are not left on the floor, since her room is sometimes cluttered). - On the right wall, close to but not against the back wall, is the bookshelf unit. Fairly big, and packed with books. 4 shelves. Has at one point 2 bags, a picture, and a box on it in front of the books on the shelves, indicating a cluttered room. Top is near empty, if not completely empty. - On the right wall, next to the bookshelf. This is confusing, since *sometimes* there is a window there, *sometimes* a poster, *and* when Akane kicks the mallet from Kodachi, that area (which Kodachi is fully in front of) is blank wall. In all observations, I am using the VIZ release. Specifically, the US first release for those two books. However. That being the case, it still changes almost nothing on the fact inconsistencies exist in the portrayal of that room. Even if VIZ only swapped the images some of the time, that would not solve the issues. Desk drawers suddenly don't add or subtract. handle styles do not change. The bay entrance should not be there only part of the time. Lights and wall switches do not appear and disappear. And so on. The pictures *could* be a mere matter of change, though the episodes were very close together. I myself last reorganized my room 13 months ago... though 1 picture has gone up since then. The whole reason for the above in the first place was I was trying to figure something out I was reading in a fanfiction that was not making sense, and could not figure it out based on the on-line maps of the house I found at the time... which was if not the same very close to the one in the opening post. FYI: one thing noticed... where is Soun's room in that drawing? But I believe the rare-earth OVA I took two of these pictures from was an attempt to clean things up and organize properly. Some details not important right now are prone to be glanced over, some details mutate to fit comedic purposes. Broad strokes are always better, it's like dynamic detail level. Like something you don't notice when focused on the action. Usually much better for the story as well because it helps the writer conserve brain resources. Unless it's a murder mystery, detective or something else requiring high precision of details. Also, Akane's bed is along the *right* wall as per anime and un-mirrored manga. where is Soun's room in that drawing? It is believed it's the one between the living room, the kitchen and the furo. 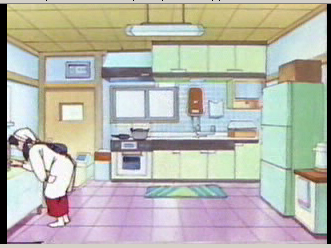 The layout of the tendo home really seems to only depend on what is needed at any time. I've had this same issue with a story ive been working on, where I wasn't sure on the layout either. It doesn't help much. Especially if your trying to map out the way each room is set up, because they change often enough. 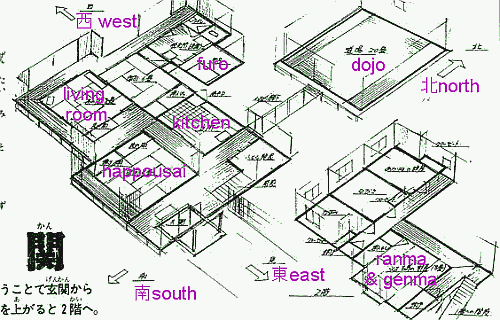 Some rooms, like the living room and dojo stay more or less the same but the map looks more or less a reasonable representation for the most part. even if there are likely parts within the manga where the manga contradicts this layout.